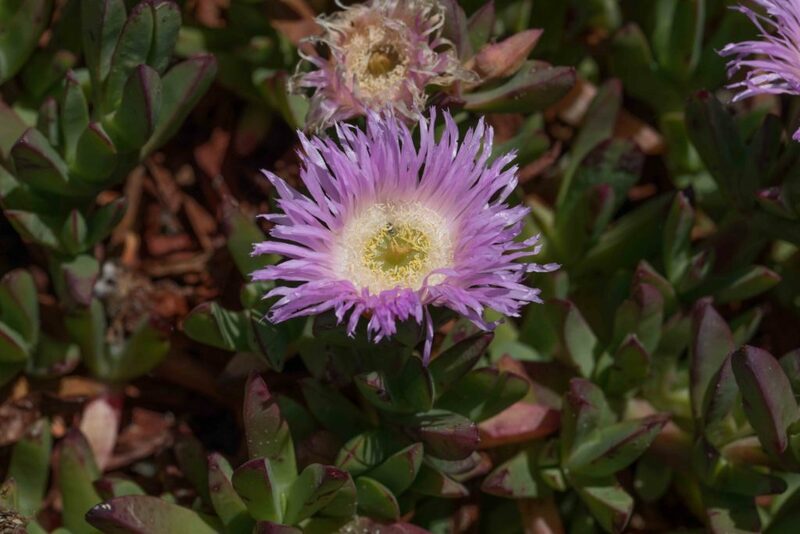 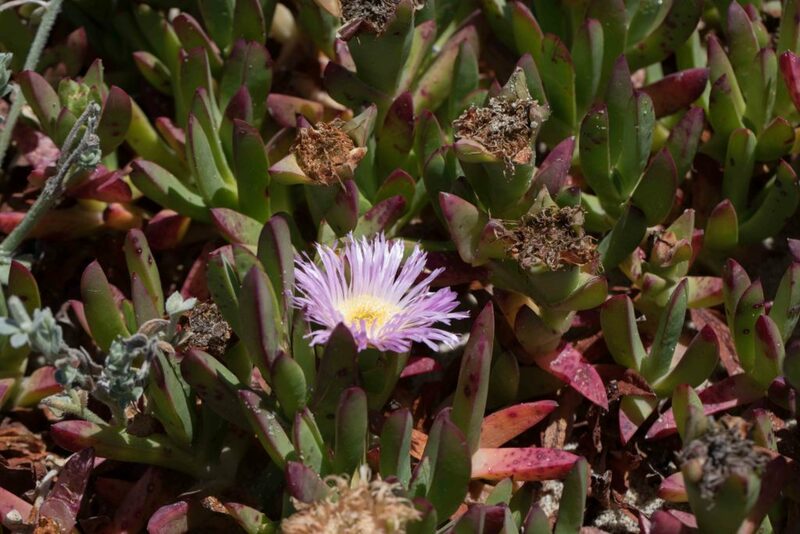 This is less invasive than Hottentot Fig (Carpobrotus edulis) and has smaller, rose-magenta flowers with petals 1–2.5 cm. 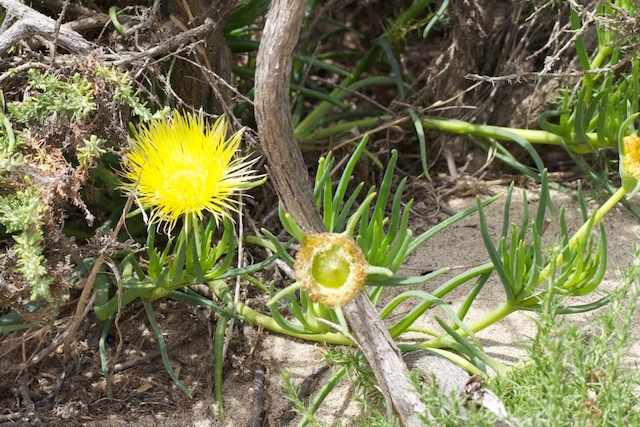 The leaves are noticeably triangular in cross-section, not serrated towards tip and generally smaller than those of Hottentot Fig. 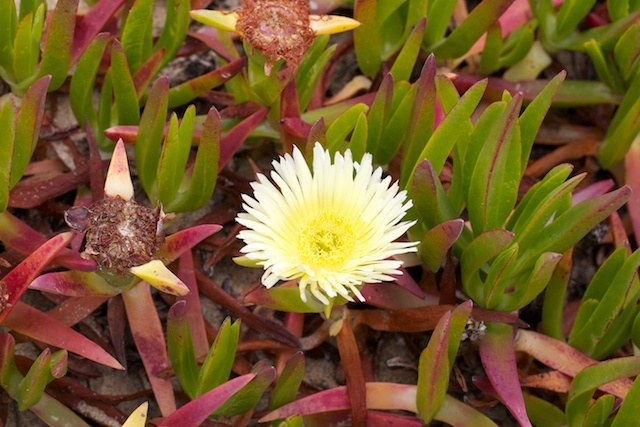 One of the highly invasive, common iceplants found on the dunes. 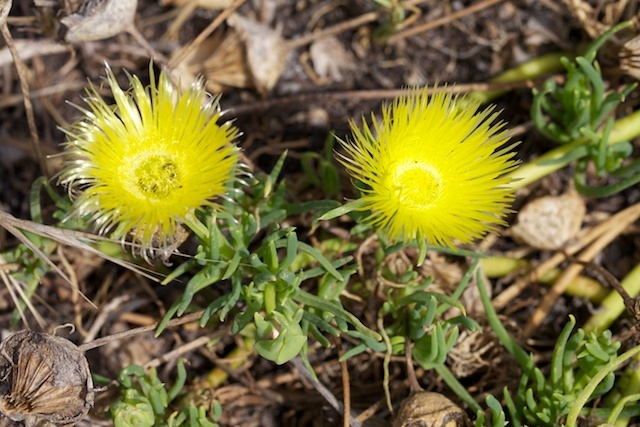 Yellow flowers, often turning pink with age. 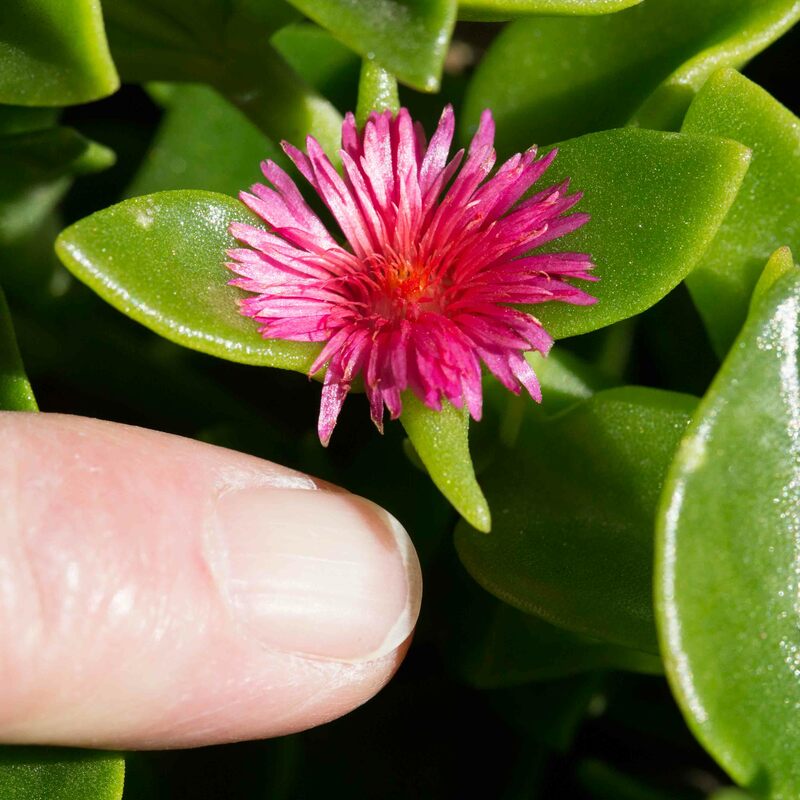 Petals 3–4 cm. 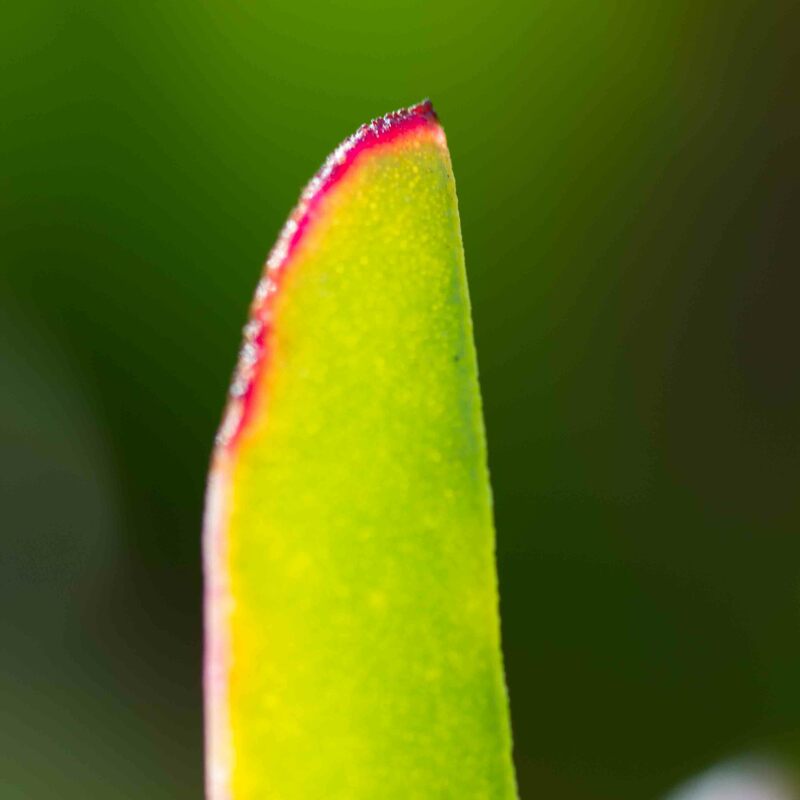 Leaves are noticeably triangular in cross-section, tiny serrations near tip. 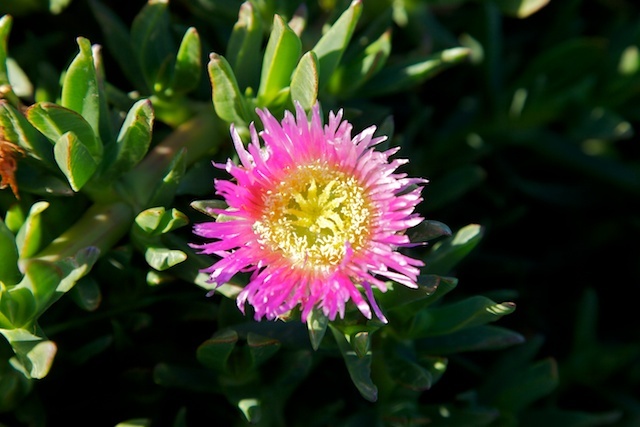 Once commonly but inadvisably planted as a dune stabilizer – extremely difficult to eradicate. 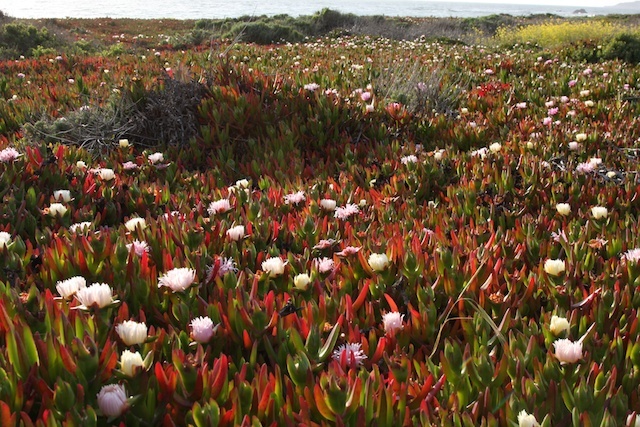 Much less common than Hottentot Fig or Sea Fig (Carpobrotus edulis & chilensis) though still invasive. 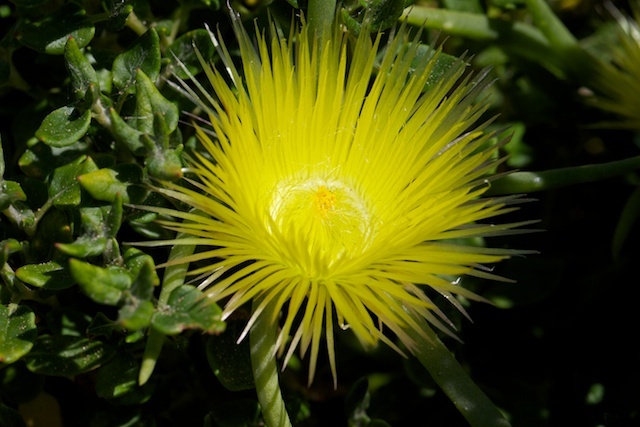 It has shiny, bright yellow flowers with linear petals ciliate in the lower half. 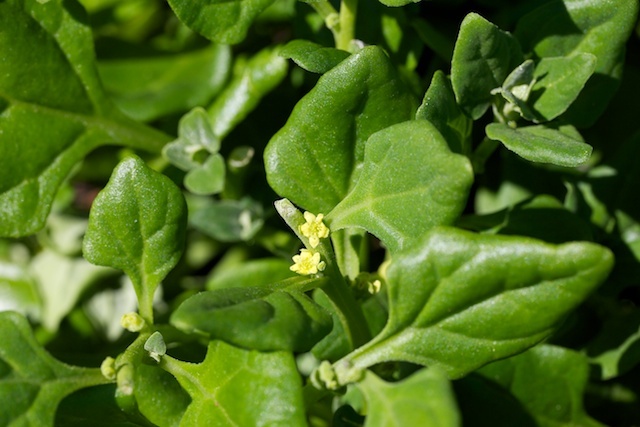 Leaves are linear, roundish in cross-section, up to 20 cm long. 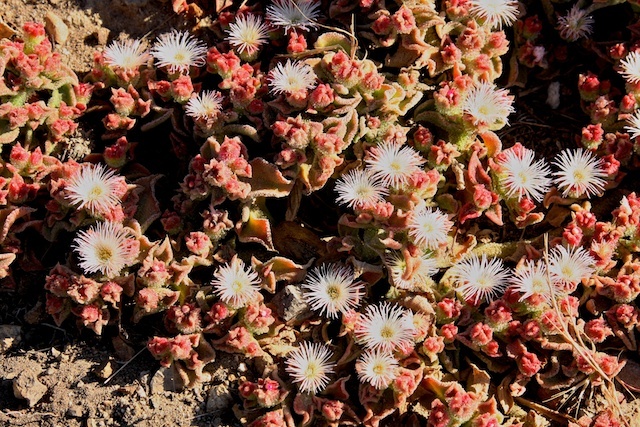 This is distinguishable by its white flowers and crystalline salt-encrusted leaves. 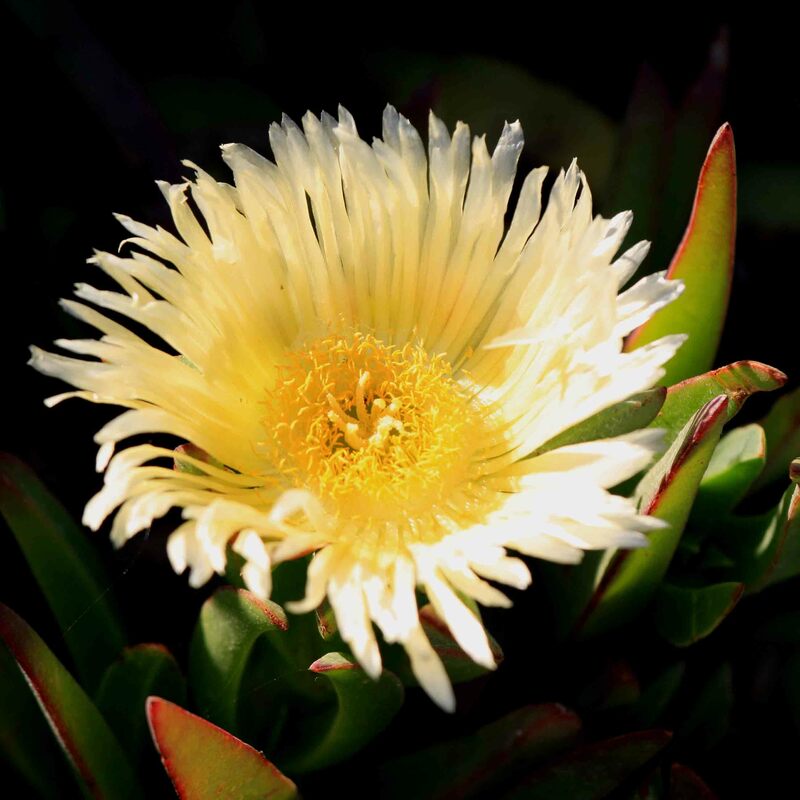 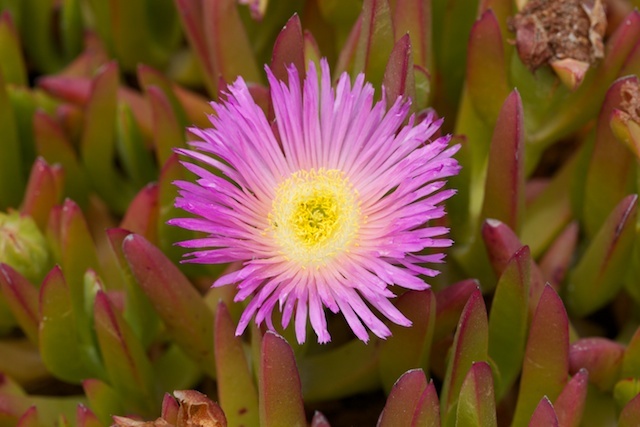 Sometimes erroneously thought to be a native species, but like most other iceplants it is in fact a South African native. 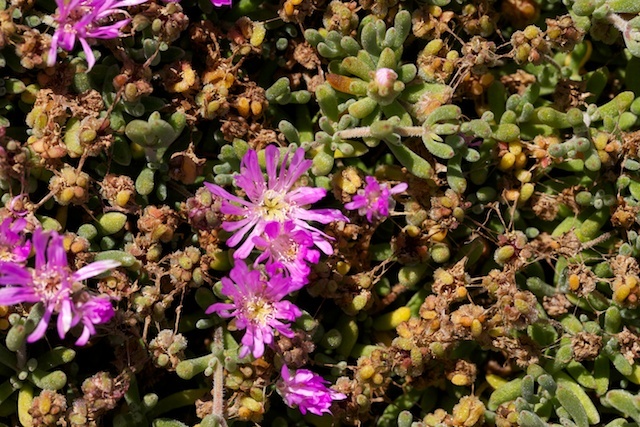 Very common in coastal areas. 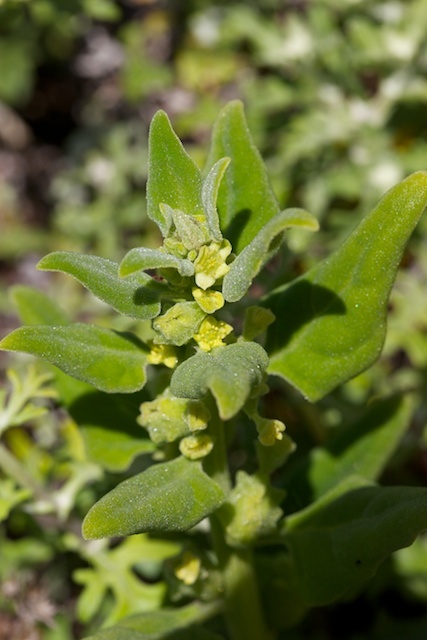 It has many spreading stems and fleshy, triangular-ovate leaves. 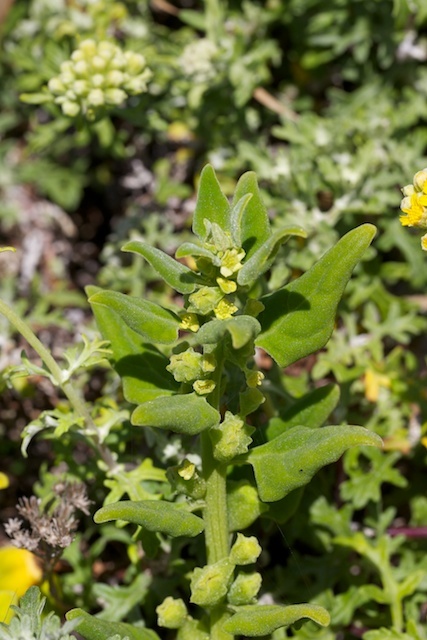 Its inconspicuous yellow-green flowers appear alone in the leaf axils. 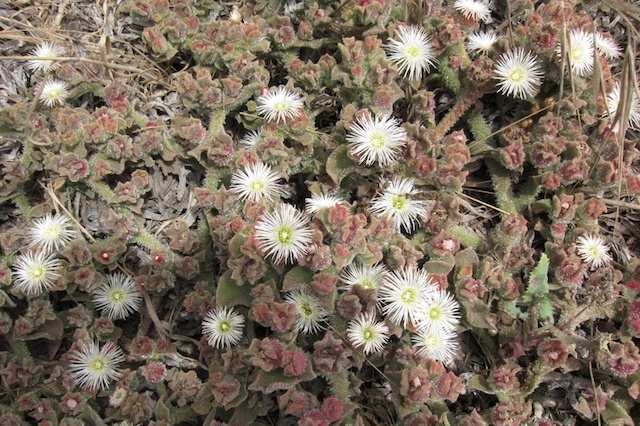 The leaves are edible and covered with many tiny crystalline bumps. 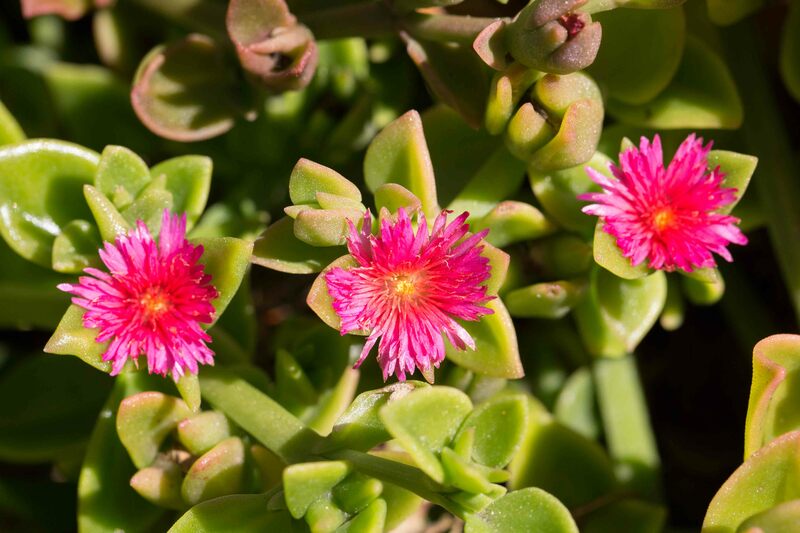 Occasional escape from cultivation. 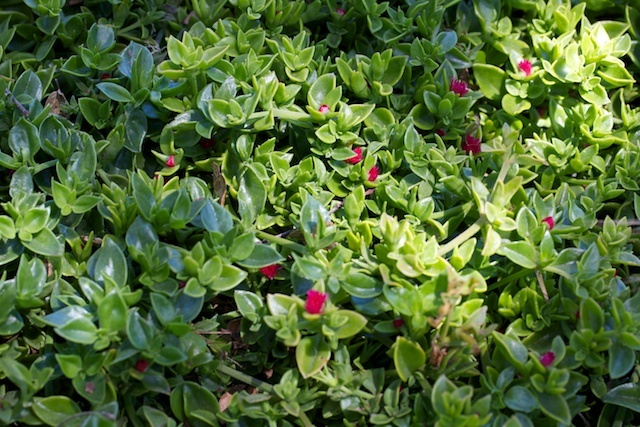 Very small red flowers and flattish leaves. 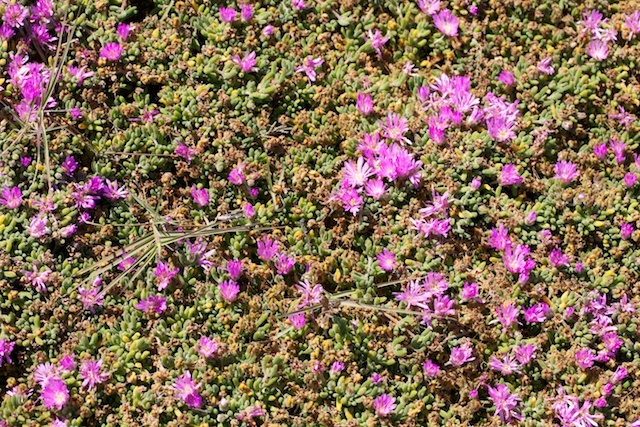 This is marked by a multitude of small, pinkish-purple flowers and very small, fleshy leaves. 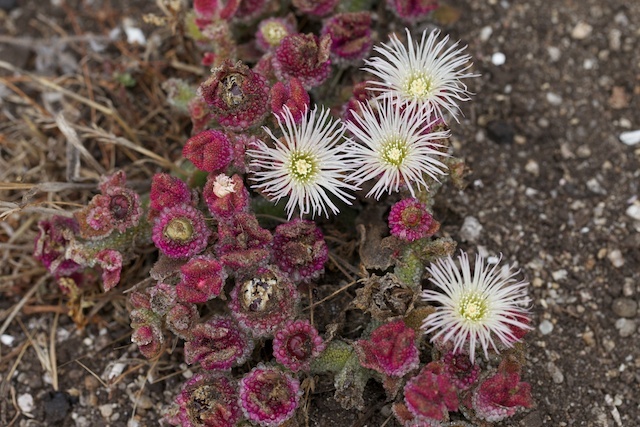 A related bright red species (Royal Dewflower (Drosanthemum speciosum)) is found along 17 Mile Drive. 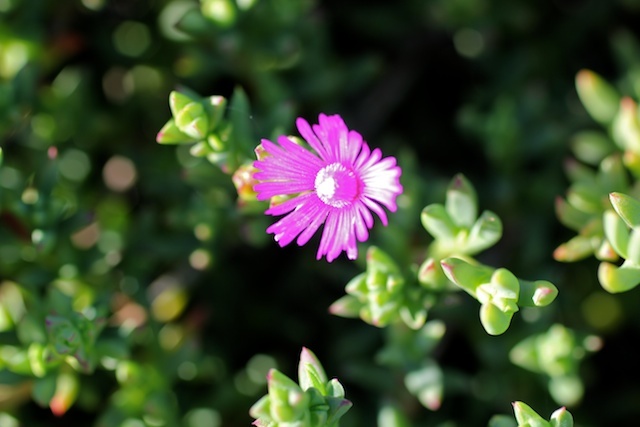 Very common in Pacific Grove where it has become something of a symbol of the town’s landscape.